Rare Offering! Refined Victorian Elegance on Chestnut Street! Amazing Location nestled between Monument Square and the Training Field! Unmatched in the Marketplace with Two Separate Parking Spaces at your Door! This Spectacular Home encompasses the entire First floor! Towering 11′ Ceiling Height! Truly a Perfect Floor plan for any Lifestyle! Dramatic Entrance Foyer with Period Staircase! Grand Front to Back Formal Parlor & Dining room with Built-In China Cabinet! 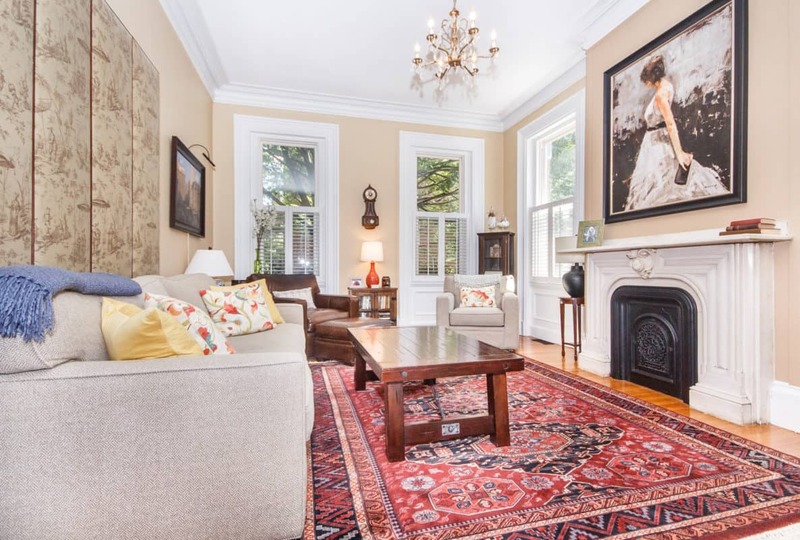 Historic Cornice Moldings & Period Marble Mantels! Windows are Everywhere! Enjoy the Most Amazing Sunshine you will find in one of the most Historic neighborhoods in the City! Gourmet Chef’s Kitchen! Gleaming Pumpkin Pine Floors throughout! Lovely Guest Bedroom with Custom Closets! Wonderful Master Suite with Bath! Direct access to your large Private Sundrenched Deck makes for memorable outdoor Entertaining! Private Storage Room! So many amenities! Investment Grade Home!